THE BIRTH OF THE NEW TESTAMENT by C F D Moule: Ch.6. 'But where is your Messiah?' Just as the grosser idolaters had pointed derisively at the Jews' empty shrine until they were forced to exclaim 'As for our God, he is in heaven' (Ps. cxv. 3), so the non-Christians, both Jew and Gentile, naturally asked the Christians what had become of the King whom they alleged to have been raised from death. And, within their own hearts, the Christians had to meet the same question. If Christianity was to explain itself, one of the foremost difficulties that it had to explain was the invisibility of the Christians' Lord, and the patent fact that his reign of peace was not yet implemented. According to the Acts and Jn xxi, there was a period after the crucifixion during which Jesus showed himself alive to chosen witnesses, though not to any others (Acts i. 1-11, x. 40 f., xiii. 31, Jn. xxi); and it was during this period that they actually entertained hopes that at any moment he might manifest himself to tta whole world and restore supremacy to Israel: ' Lord, is this the time when you are to establish once again the sovereignty of Israel?' (Acts i. 6). When this hope proved illusory, and he was finally and decisively withdrawn from sight, they looked forward to a very speedy return. And the vivid manifestation of power and confidence at Pentecost was hailed as an interim gift from the exalted Lord, until the consummation of God's plan, when Jesus would return (Acts ii. 33, iii. 21). And there is little doubt that this was the prevailing pattern of expectation for a long time – as indeed, mutatis mutandis (and extensis extendendis), it still is in many Christian hearts to this day: Christ, exalted to God's throne in heaven, destined to descend again at the end, and in the meantime represented on earth by apportionings of his Spirit and power; the Church, meanwhile, being charged with the task of spreading the good news and winning converts. That, basically, is the pattern of Paul's expectation throughout his extant epistles. However much his inspired understanding deepens the theological and religious meaning of the Spirit, it is still true of Paul's view that to be incorporated in Christ is to possess a citizenship in heaven, whence we expect Christ to come as Saviour (Phil. iii. 20). Christ dwells by his Spirit among us now: to cry 'Abba! Father!' is to be enabled to utter, by God's Spirit, the cry of Christ's filial obedience (Rom. viii. 15, Gal. iv. 6). But this is yet to be consummated at the revealing of God's sons: the Holy Spirit is still only the pledge and first-fruits of something in the future (Rom. viii. 21-23, 2 Cor. i. 22, Eph. i. 14). Even St John's Gospel, often taken to represent the complete exchange of future expectation for present realization, with the coming of the Paraclete replacing the return of Christ, really goes no further than to stress the importance on the individual level of the present indwelling of the Spirit. [See C. F. D. Moule, 'The Individualism of St John's Gospel', Nov.T. (Festheft for E. Stauffer), forthcoming.] To each individual who responds there is already a coming of the Holy Spirit; already the disciple is where Christ is. But there is nothing here to replace the corporate consummation of the whole People of God as a future event. And it is, becoming clear that it would be a gross oversimplification to arrange New Testament eschato-logyas an evolutionary tree, with a primitive parousia-expectation at its roots, with St Paul as an important transitional stem, and with the Fourth Gospel as the ripe fruit of developed and integrated thinking at the top. The already 'realized' coming of Christ in St John is only on the individual level, and it requires comparatively little lapse of time or development of thought to attain to that conviction. Conversely, a vivid expectation of a future consummation is perfectly compatible with a doctrine of the Spirit on an even deeper level than the Johannine: that is proved by Rom. viii. Thus the New Testament, taken as a whole, offers us little deviation from this essentially simple pattern: Jesus has been declared the royal Son of God by the resurrection (Rom. i. 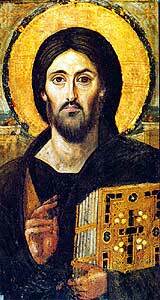 4): God has made him both Lord and Christ (Acts ii. 36). Already he reigns in the hearts of his own. But he has passed from sight without yet being universally recognized and acclaimed. It is for the Church, empowered by the 'Holy Spirit, to work for this end (Acts i. 7 f., etc.). Therefore, if the Christian is asked, or asks himself, 'Where is your King? Why is not his reign evident?' he is bound to reply that the Kingdom, though indeed inaugurated, is not yet consummated. The clearest expression of this is in 1 Cor. xv. 25, 'he is destined to reign until God has put all enemies under his feet' (the allusion is to Ps. cx); and its conclusion (v. 28) that when this is achieved, then Christ himself will be subjected to God, is (in the light of later credal formulations) startlingly 'subordinationist' (cf. 1 Cor. xi. 3, where there is a kind of hierarchy, ' God-Christ-man- woman'). But, though more faintly, the same idea seems to make itself just audible in Rev. xi. 15, where the sovereignty of the world is declared to have 'passed to our Lord (God) and his Christ' – implying some consciousness of a distinction. So in Matt. xxv. 31 ff., there may be some relics of an awareness of 'the kingdom of Christ' as distinguishable from 'the Kingdom of God'. [See C. H. Dodd, 'Matthew and Paul', in his N.T. Studies (1953), 53 ff. (originally published in E.T. 1947).] If so, however, Rev. iii. 21 shows how, side by side with such a notion, the conception of the equal kingship of Christ and of God can occupy the thoughts (' I myself was victorious and sat down with my Father on his throne'); and it is doubtful whether even those Pauline passages indicate more than a recognition that the Church is living in an interim-stage, waiting for the consummation and implementation of Christ's victory which is God's victory. The Pauline formula which describes Christians as ' in Christ' rather than 'in God' is comparable: and, significantly, the sole instance of his using the double formula, 'hidden with Christ in God' (Col. iii. 3) is in a context of eschatological expectation. Relevant to the same issue is the New Testament attitude to the conquest of the demonic powers by Christ. Cullmann [O. Cullmann, The State in the New Testament (1957).] has argued that Christians saw the cross as the conquest of the malign powers, who thenceforth are reduced to obedient servitude – so much so that now it is a positive duty for Christians to obey and be subject to them as servants in Christ's kingdom. C. D. Morrison, on the contrary, argues [C. D. Morrison, The Powers that Be (1960).] that, although, on the Christian showing, Christ always had been and is eternally supreme over the 'powers', his death, in itself, made no difference to their temporary ascendancy, but only relieved Christians, as such, from the necessity of submitting to their tyranny. The most problematic verse for Morrison's position is Col. ii. 15 (' on that cross ... he made a public spectacle of them . . .'), which seems very explicitly to define the cross as the occasion of the triumph over the powers. But in the main his position is convincing. In any case, what matters for the moment is that Christian speculation about these demonic angel-powers bears further witness to the sense of an interim-stage, awaiting the final consummation. Such variety as there is in the New Testament formulations of this interim-idea depends on the variety of situations addressed. There will be more to say about this when we come to consider error and heresy within the Church. But for the time being it is worth while to observe that there were two extremes in misunderstanding which had to be met. First, there were those who said that the resurrection (of Christians) had already taken place (2 Tim. ii. 18; cf. 1 Cor. xv and ? 2 Thess. ii). 2. [Cf. E. Schweizer, Lordship and Discipleship (as on p. 56, n. 3), 112, and see 28, n. 1.] This was presumably a dualistic and 'gnostic' type of thinking: denying the reality or the importance of the material world and concentrating on the private religious experience of the individual soul, these heretics maintained that by baptism they were already made partakers of the risen life and that there was nothing further to follow. (They could quite easily have misunderstood the outlook represented by Jn in this sense.) In reply, Christians who were loyal to the apostolic witness maintained that the visible, resurrection-body of Jesus was the first-fruits and guarantee not of escape from this world, but of its redemption, and that they looked for a corporate event still in the future – the raising of all God's people together into a new life, 'the emancipation of the body' (not 'from the body", Rom. viii. 23). They affirmed corporate redemption as against individualistic escape. Secondly, there were the 'scoffers' who said, 'You can wait forever and nothing will happen. Things are going on exactly as they were before. There will never be an end to the world.' The real mistake here is to make time the determining standard at all. The very form of the scoffing bears witness to a misunderstanding of the real issue. For the Christian's hope is not to be measured primarily in terms of lapse of time but in terms of the continuous working out to its completion of a datum already given – namely the incarnation. [See J. A. T. Robinson, Jesus and his Coming (1957), where this point is finely made, even if one does not go all the way with other aspects of the argument.] New Testament eschatology at its deepest level concentrates upon entering into, implementing, loyally expressing that which is already given, which is Christ: it does not say, 'How long will it be before the whistle blows "no side"?' but, 'Where ought I to be now, to receive the next pass?' In other words, the fact that the kick-off has taken place, that the game is on, and that we have a Captain who can lead us to victory, is all that matters. Yet, once the false question was formulated, it was difficult to avoid an answer in its own terms; and 2 Pet. iii. 8 shows us the application of Ps. xc. 4 as an ad hominem reply: God's time-scale is different; to him a thousand years are as a single day; therefore you cannot blame him for delay! Whenever time-scale considerations come in, we seem to find unprofitable judgments. If the scoffers traded on 'delay' to draw false inferences, the opposite extreme – the oppressive sense that 'the time is short' – seems to have led Paul to some of his least enduring judgments. Both the expectation of a parousia the day after tomorrow and its postponement sine die seem to have led to unfruitful conclusions. But neither of these is characteristic of New Testament thought, which concentrates far more on the datum – on the fact that already the Kingship of Christ has been established, already the Kingdom of God has been inaugurated, and that the responsibility of the children of the Kingdom is to act here and now as those who are charged to bear witness to its reality. [Cf. E. Schweizer, Lordship and Discipleship (as on p. 56, n. 3), 22 f.: 'It is possible that for a while the expectation of the approaching parousia suppressed any other questions. But we must say that this expectation has not exercised any substantial influence on the earliest summaries of the Church's faith.' E. Kasemann writes: 'The Johannine assertion that the judgment is already taking place was, in nuce, already anticipated in the Christian community of the earliest post-resurrection period, even if, in John, it is expressed in a form which is different from the point of view of the history of theological development'. ('Die Anfänge christlicher Theologie', Z.Th.K. 57. 2 (1960), 183 (my paraphrase)). Thus, the future (in detail) was never the primary concern; it was the past leading to the present that occupied the attention of Christians when they were really Christian. And consequently, it is a mistake to read the New Testament as though the 'delay of the parousia' were a conditioning factor of essential importance – still worse to measure the chronological sequence of the writings by supposed developments depending upon it. There may be – there probably are – developments in emphasis: [See C. H. Dodd, 'The Mind of Paul: Change and Development' in New Testament Studies (1953, but originally in B.J.R.L. 18. 1 (1934)). 69 ff.] but the general programme of expectation varies little; and even changes in emphasis are an unreliable measure of chronological development. As I looked, this horn made war with the saints, and prevailed over them, until the Ancient of Days came, and judgment was given for the saints of the Most High, and the time came when the saints received the kingdom. Such was God's message through apocalyptic to the Maccabaean martyrs and their generation. And in the New Testament, besides many apocalyptic phrases and sections interwoven with the rest, there stand out three main examples: the Revelation – a long, sustained piece of apocalyptic writing – the Gospel apocalypses (Mk xiii and the various parallels), and 2 Thess. ii. Speculation on the origins of these three or more apocalypses is rife. The attempt of Caligula to introduce his image into the Temple, and the beginning of persecution in connexion with Emperor worship are the obvious crises by which to account for these manifestations; and these, and additional circumstances, call for further consideration in the next chapter.